SITRA, Bahrain — Sometimes a name suggests a condition. There was Beirut a generation ago, Baghdad more recently. 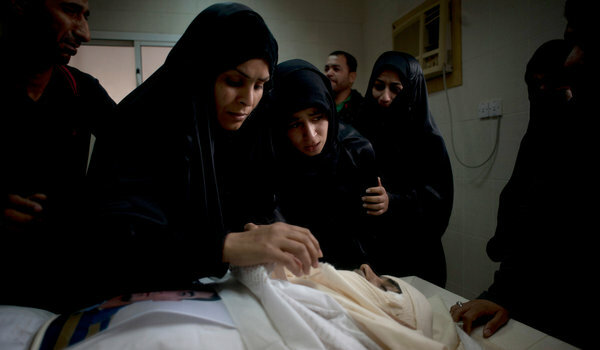 In Bahrain, a Persian Gulf state so polarized that truth itself is a matter of interpretation, it is Sitra. Here, the faces of young men foretell a future for the country that looks like the rubble-strewn and violent streets of this town. On a recent night, after clashes that erupt almost daily, one of them entered the house of a relative, squinting as though he had stumbled from a dungeon into the sun. Tear gas. His friend smirked as he showed the smooth scars left by rubber bullets fired at his leg and chest. Another shrugged as he removed his shirt to reveal a back scarred by pellets. “We can write anything now!” said an editor of the Egyptian newspaper Al-Ahram to some visiting Danish participants in Cairo as a part of a recent Alexandria-based conference called “Media´s Role for Changing Society and Democracy”. The Egyptian revolution has certainly become a catalyst for free speech and for more political debate in Egyptian media. Yet, the chaotic climate of the revolution has also suffered some backlash. Another editor at Al-Ahram warned that the media in Egypt is now in a political limbo, and can sometimes even motivate the Egyptian public towards sectarian violence and false information. The conference and the changing media landscape made it clear to all participants that both mass media communication as well as Muslim-Christian dialogue were of immense importance during this time of transition in Egypt. And participants did note that the media has the potential to promote positive dialogue. New media, especially social media sites like YouTube, Facebook or Twitter, has brought new players into the game of mass communication and challenged the hegemony of the “old” regular mass media. SHAH ALAM, Malaysia – About 2,000 slogan-shouting Malaysian Muslims gathered near the capital on Saturday to denounce alleged Christian attempts to convert Muslims, widening a religious rift that could cost Prime Minister Najib Razak minority votes in upcoming polls. The rally led by non-governmental bodies comes amid an escalating row over accusations of covert conversions among Muslims and a raid on a Methodist church, which has divided Muslims and angered ethnic minorities. Men, women and families gathered in a stadium in a suburb outside Kuala Lumpur to unite against what they said were attempts to evangelize Muslims, an offence in a country where over half the population follows Islam. “We have gathered today to save the faith of Muslims due to the threat of apostasy,” Yusri Mohamad, chairman of the organising committee, told the crowd. Many of us have long thought the world had become liberal enough to stop execution of persons for practicing their religion. 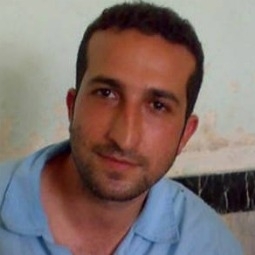 Yet, modernity is confronted with this religious issue because Youcef Nadarkhani, an Iranian convert to Christianity now faces a governmental threat of execution. 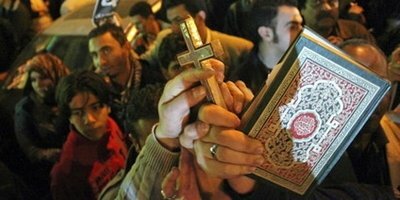 Attacks on Coptic Christians in Egypt by Muslim groups is another troubling, if less dramatic example of intolerance towards Christianity in Islamic countries. 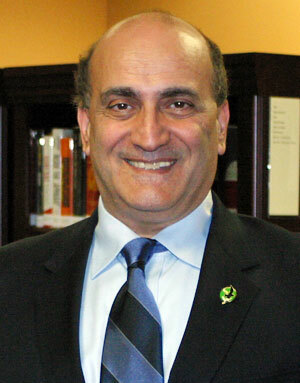 while in the United States,Mormonism is held suspect and Herman Cain and Newt Gingrich have adopted positions denying American Muslims of equal rights in this country. We hold religious freedom as a nearly sacred right. But what happens when practicing your religion prevents someone else from practicing theirs? When two sets of religious rights clash, deciding between them usually requires the Wisdom of Solomon – but a “cut the baby in half” approach (1Kings 3:16-28} often results in tragic decisions. CAIRO (AP) — Hundreds of protesters marched Friday from Egypt’s pre-eminent mosque to a central Cairo cathedral in a show of Muslim-Christian unity after a bloody clash earlier this week involving Coptic Christian protesters and the military. Demonstrators chanted slogans against the country’s military ruler, Field Marshal Hussein Tantawi, who has increasingly become the focus of activists’ anger during the bumpy transition following Hosni Mubarak’s ouster in February. A crowd of onlookers threw rocks at the demonstrators outside Al-Azhar mosque, the most important center of learning in Sunni Islam. 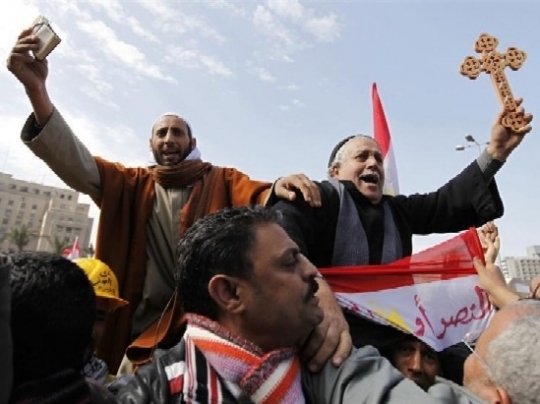 But the group of Muslims and Christians was undeterred and marched on toward the cathedral before heading to Tahrir Square and a nearby boulevard along the Nile where Sunday’s clashes took place. 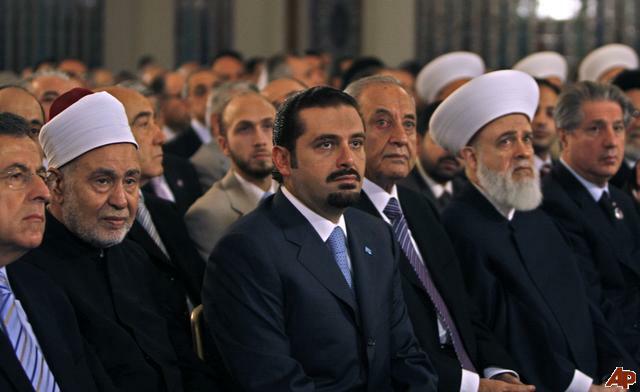 The distrust between pro-democracy activists and the military council, which is leading the country’s transitional period until presidential elections expected in 2012, deepened after the clashes. BEIRUT: Kataeb (Phalange) Party leader Amin Gemayel met the head of Cairo’s Al-Azhar, the most prestigious center of Sunni scholarship, to discuss ways to strengthen ties between Christians and Muslims and energize dialogue between the two groups, said a statement released by the party. “The meeting was very fruitful. I listened to [Tayeb’s] views on a host of issues currently under discussion not only in Egypt, but in the Arab world as a whole in the wake of [popular] movements that are taking place,” Gemayel told reporters.